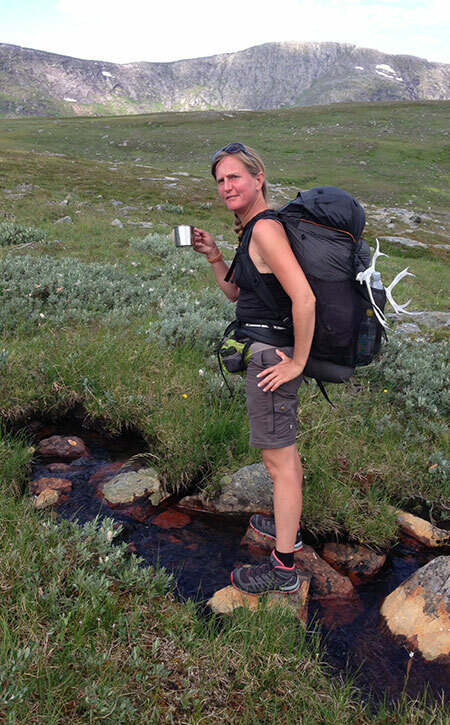 In late July 2014 I (Anna) and Christer hiked in the North of Sweden in Artfjället. 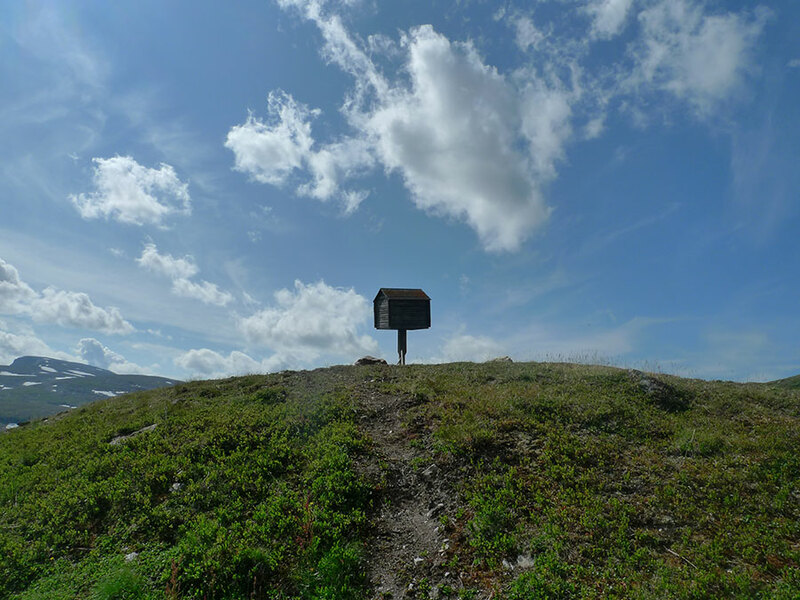 There is no hiking trails to follow but with a good map and compass it is still a rather easy area to hike in. This is our report, enjoy! We arrived by car to Strimasund in the late afternoon. 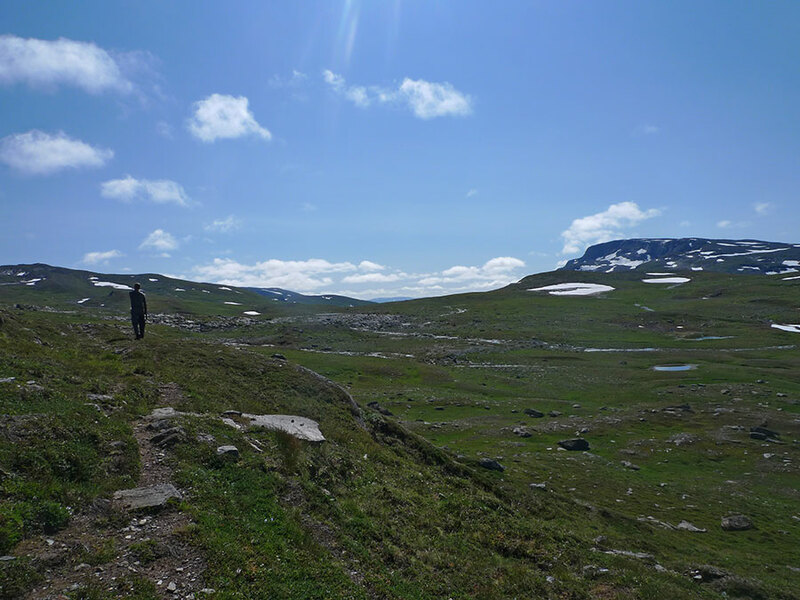 The sun was shining and we felt eager to start our hike in the Artfjället. 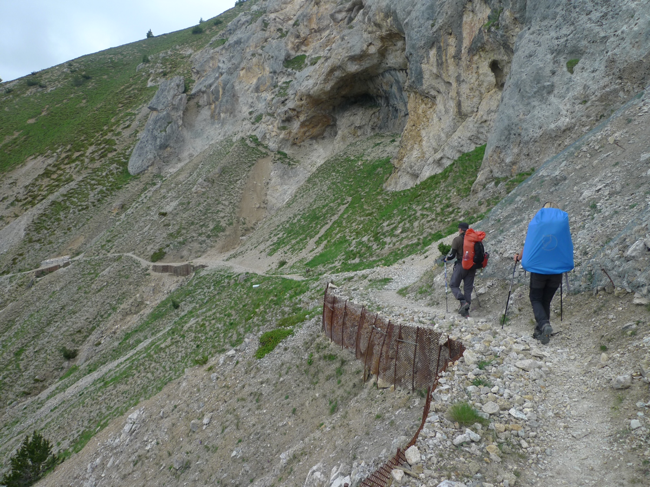 We crossed Över Uman and followed the path through the forest up to the Same viste. 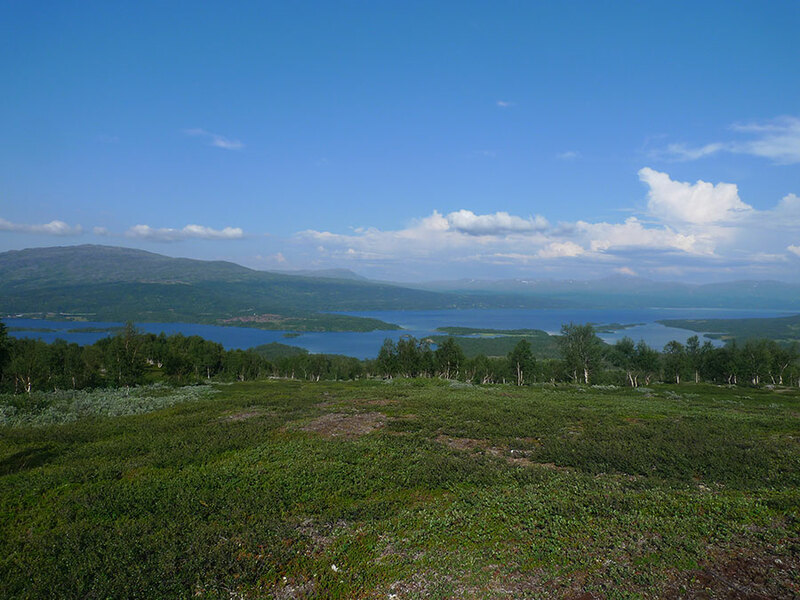 We continued upwards and after a while we left the woods and came up to the open mountain landscape. The climb was very hot, we where happy that we brought some extra water with us as we didn’t pass any on our climb up to the cave, Sotbäcksgrottan. The entrance of the cave is just a whole in the ground, you will need special equipment to visit the cave. At the cave the path ended and from now on we had to find our way with help of the map and the compass. 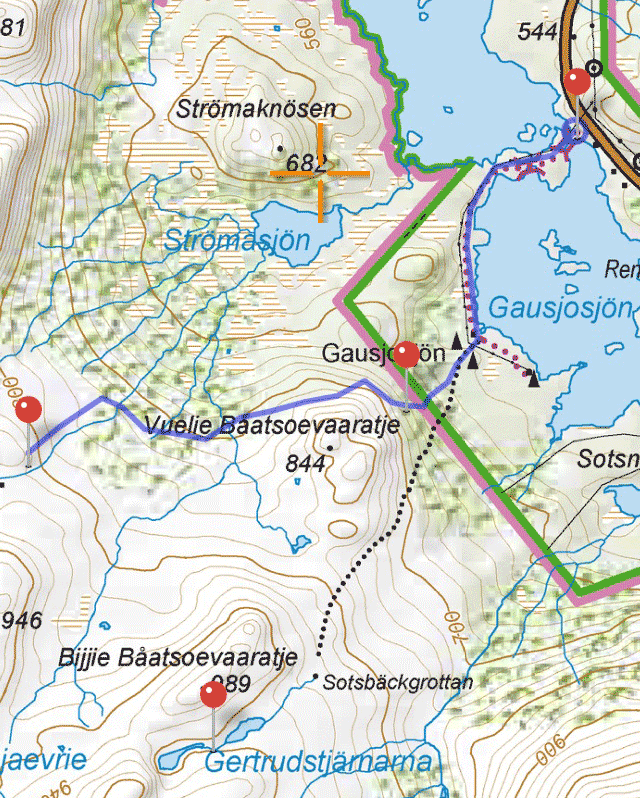 We also had an electronic map with us with a GPS function, that worked really well. 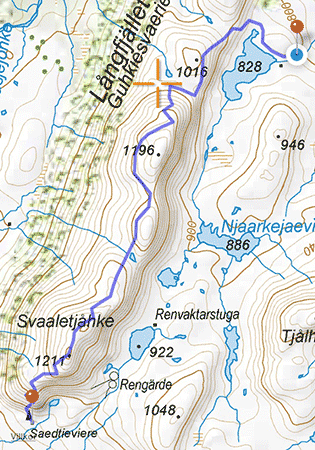 Our goal for the day was Gertrudstjärnarna, which are located just above the caves. 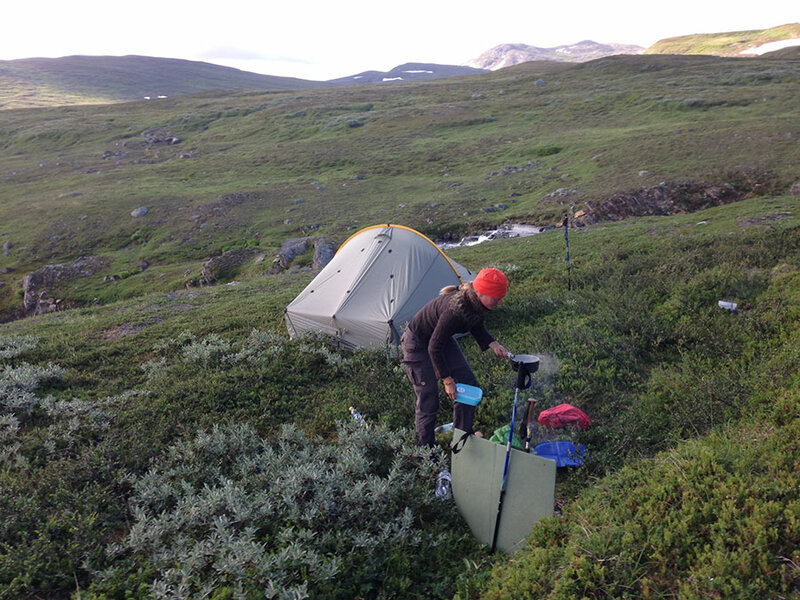 We found a place for the tent, a bit bumpy ground but it was dry and soft so it was rather ok to sleep on. We washed ourselves and our underwear in the stream. And made a late dinner. A good advise if you don’t like Mosquitos while cooking and eating is to not wait to long, around eight the Mosquitos usually showed up. But we didn’t have any massive attack during our whole hike. We made bacon, vegetables (pre-dried) with mash potatoes, to dessert we made some chocolate pudding. We had some whiskey before heading in to the tent to avoid the Mosquitos. We woke up to the sound of raindrops falling on the tent. We was a bit surprised as it had been such a nice weather for such a long time. Outside it was cloudy and a bit foggy. The rain slowed down after a while and we went up to make some breakfast. I had some Muesli with hot apple/cinemon soup (Yrrs and mine specialty) and Christer made some porridge. Two other hikers past by, they where on there way home, we where the first people they had seen for their whole hike. Sounded promising to us, even though it is nice to meet and exchange experience with other it is also nice to be totally by yourself. 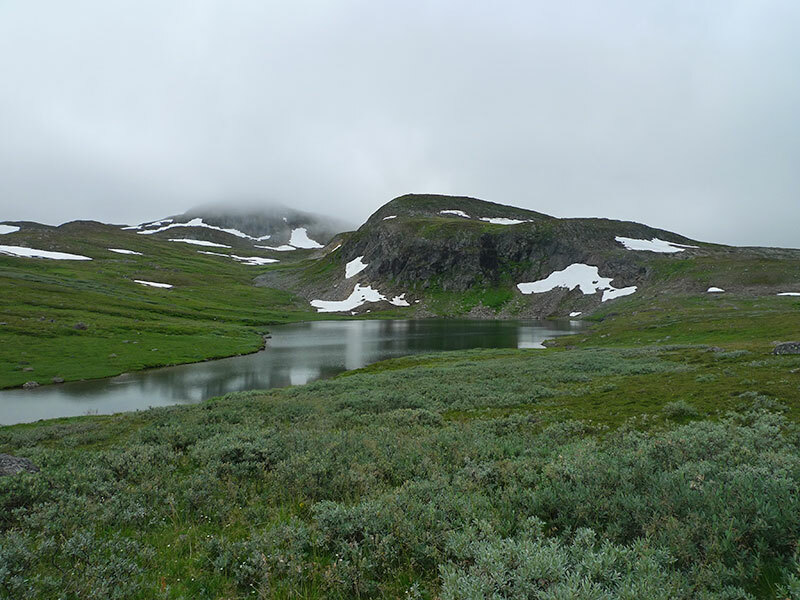 That was also the cause why we choose to hike in this area as it is not that well-visited, for some strange reasons. 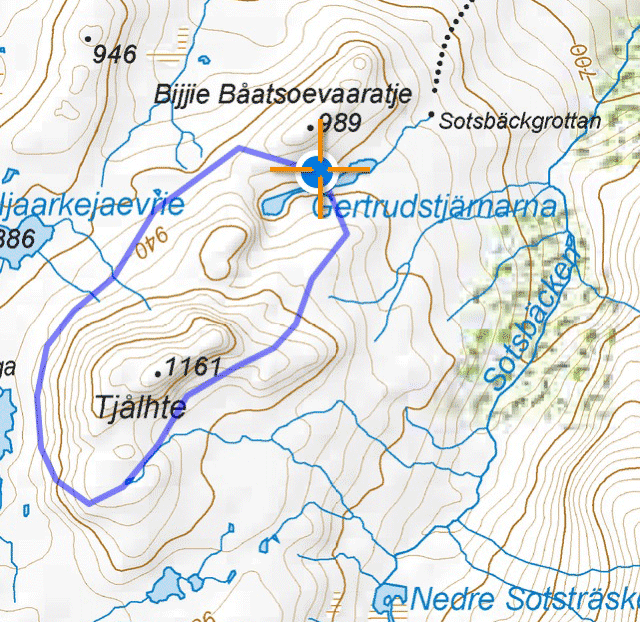 We had decided the day before to take walk around the Tjålhte mountain and leave the tent and some stuff behind and just bring what we needed for the day. 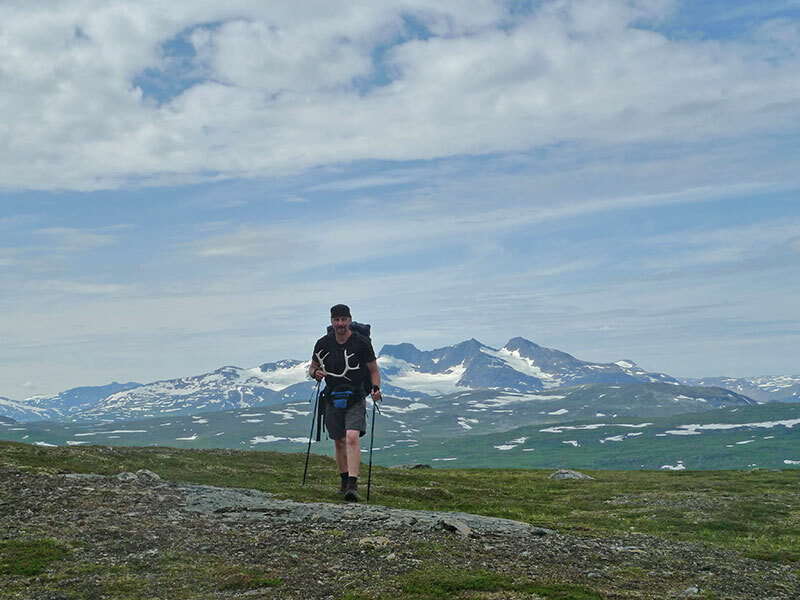 The main reason was that Christer had some pain in his leg and needed a day rest from the backpack. The weather became mush better and after a while it was full sunshine again. We walked a long the hillside. 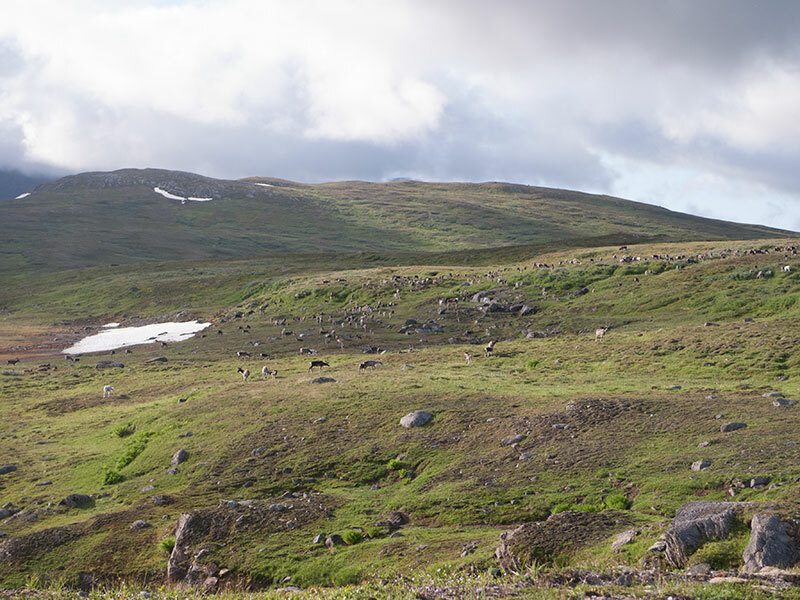 Saw some reindeer’s on the Långfjället on other side of the valley. 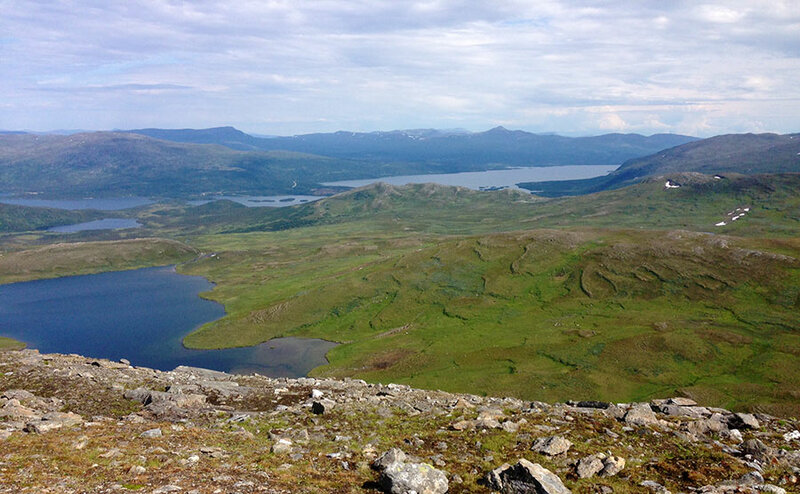 We had a lunch break at the south side of the Tjålhte. It was very hot in the sun so we tried to find shadow behind a big stone. We baked some bread and had some lentil pate with it. It tasted really good. We continued up a bit to round Tjålhte. We had to cross some snow. The climb down to the lakes and to our tent was quite wet. We did the evening routine, with washing and preparing dinner. We had to look for more wood to our wood stove. As we where over the tree boarder it was a bit tricky at some places but we found some Vide bushes (Salix lapponum) that had dead brunches that we could use. We made pasta with pesto and cream. Really jummy! For dessert we had some compote on home dried strawberrie with milk. It was delicious. When the Mosquito’s came we went inside and left the outer tent door open. The Mosquito net was closed so we safely could enjoy the nice view! The warm sun on the tent woke us up. We made breakfast and packed our things. It was time for us to leave the nice lakes. 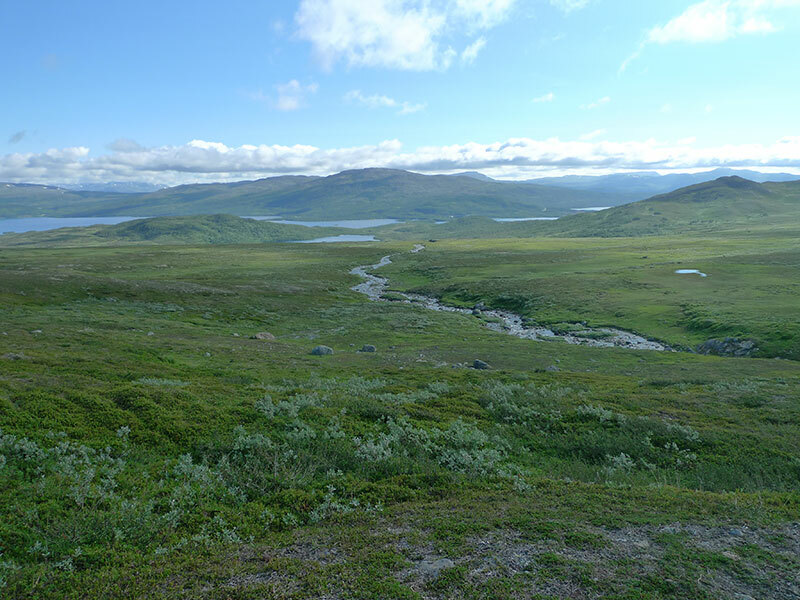 We started to cross the valley towards Långfjället. It was marshy ground and we often had to turn back and find a new way to avoid getting to wet. On the other side we turn south and walked along the långfjället. We walked by some lakes. 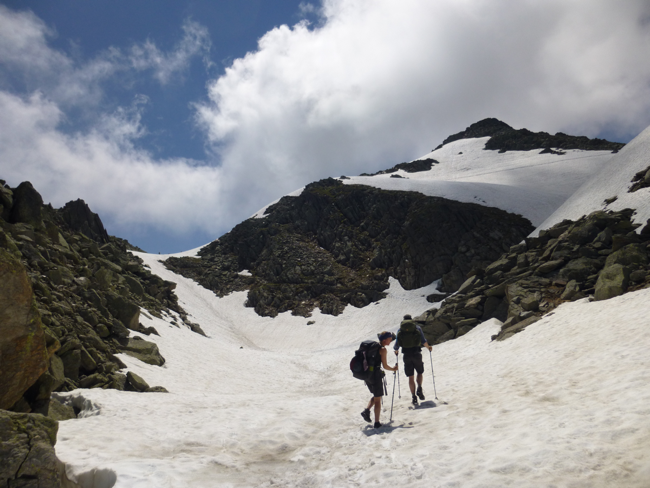 At some places we had to cross some snow. A more easy way would probably had been to cross the valley further south than we did. We came to a reindeer pen and right after that we sat down for a break in the sun. We had lunch, some nice left overs from the dinner last night. 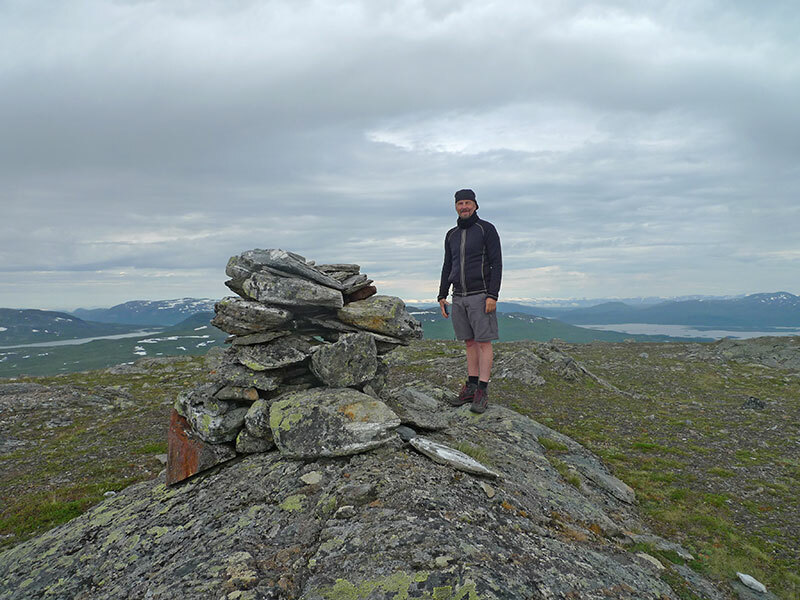 We had a great new view with the Svaalegobpe down below us and the mountain top Snjåhka which we planed to climb the next day if the weather was clear. 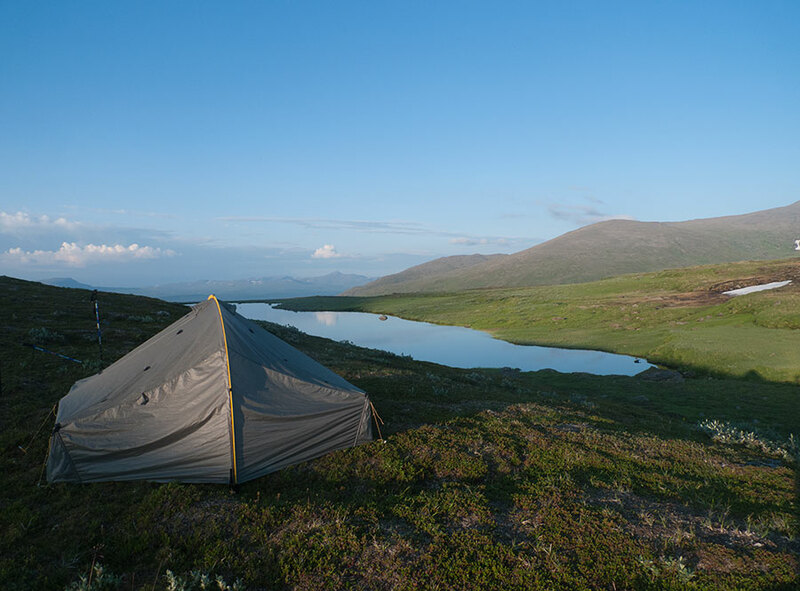 We continued and came by a sami goahti (kåta in Swedish) and just below we found a perfect nice place for a tent and we decided to stop for the day. 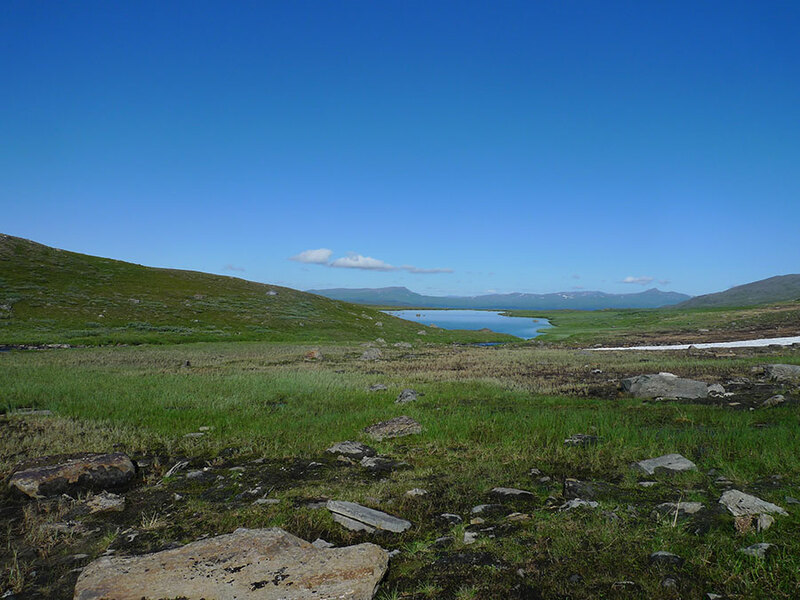 We took a walk to round the Långfjället så get a view of the other side. 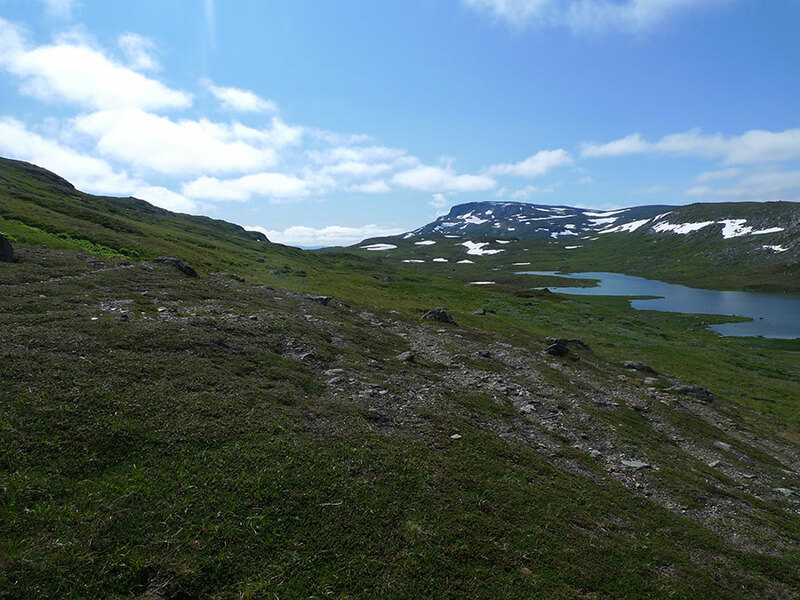 We also looked for a good place to climb up the Långfjället as our plan was to walk on the ridge on our wake back. 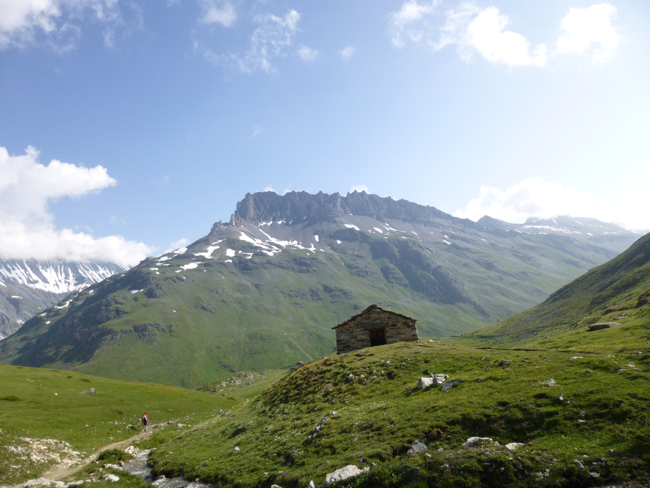 It was really hot so we turn back and had a lacy rest in the shadow of the hut. 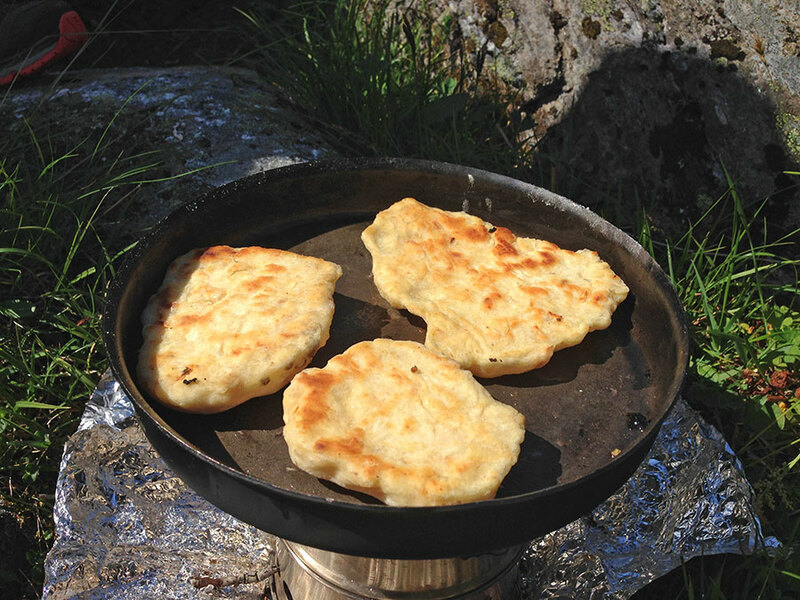 When it got cooler we raised our tent and made some bread and supper at the stream close by the tent. Vegetables couscous with some ready made garam masala mix. Simple and a lot more spicy than expected. We eat some chocolate and frieze dried raspberries and drank some whiskey. 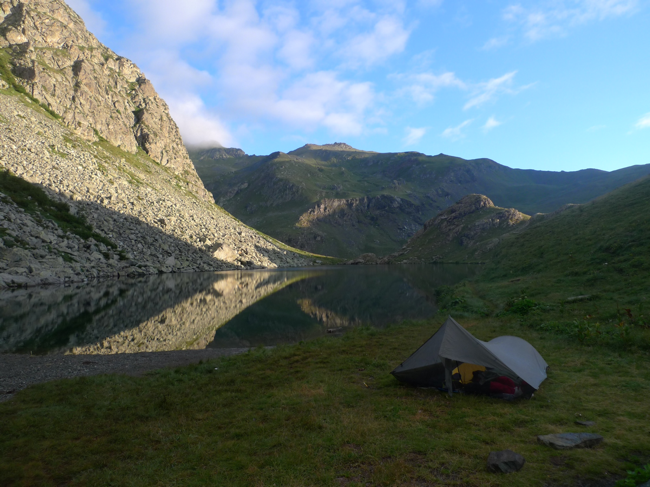 We sat in the tent, planed the next day and looked at the nice view. 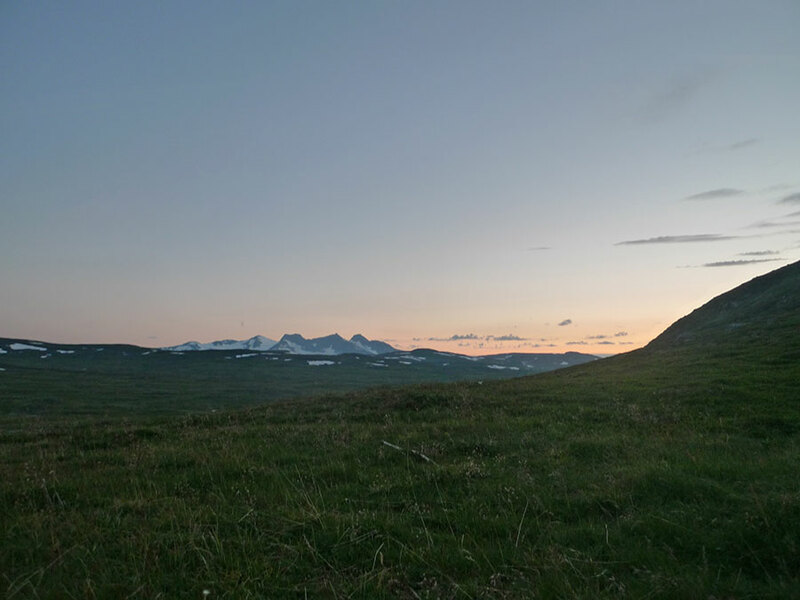 On one side we had a really nice view over the high mountain tops in Norway. Christer had a really hard night, his hurting leg had kept him awake. The few pain killers we had brought with us was almost finished and we realized that we might have to end our hike earlier than planed. 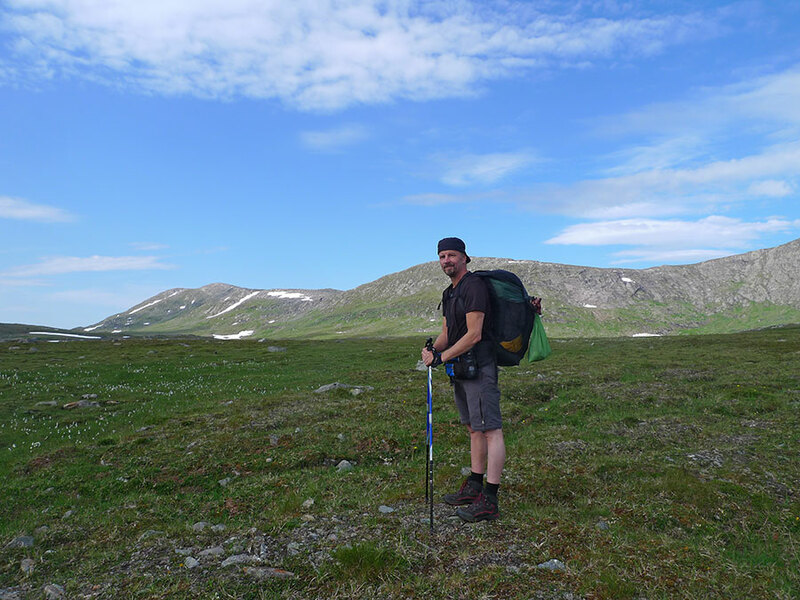 We decided to turn back north and walk up on the ridge of Långfjället and not continue further south as we had planned. We thought it would be good idea to be closer to the car if Christer leg wouldn’t become better. 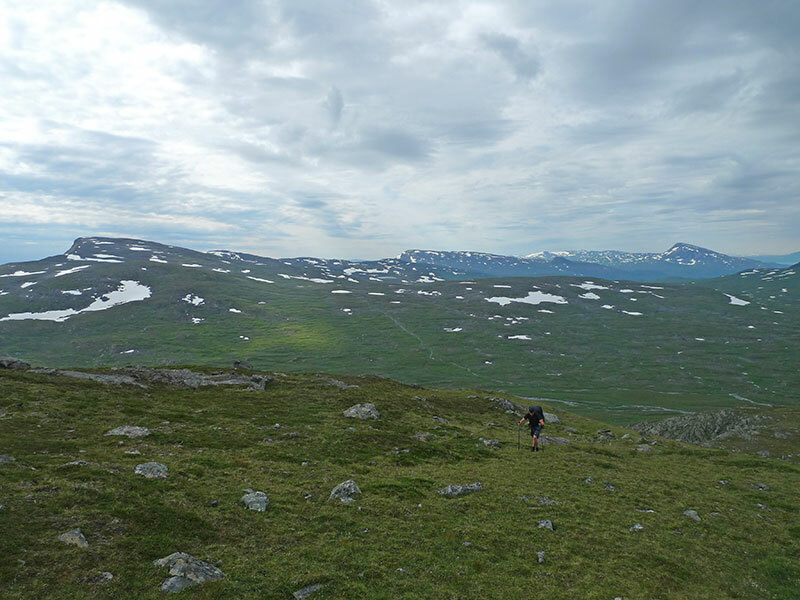 We packed and started to climb up the Långfjället from the south east side. 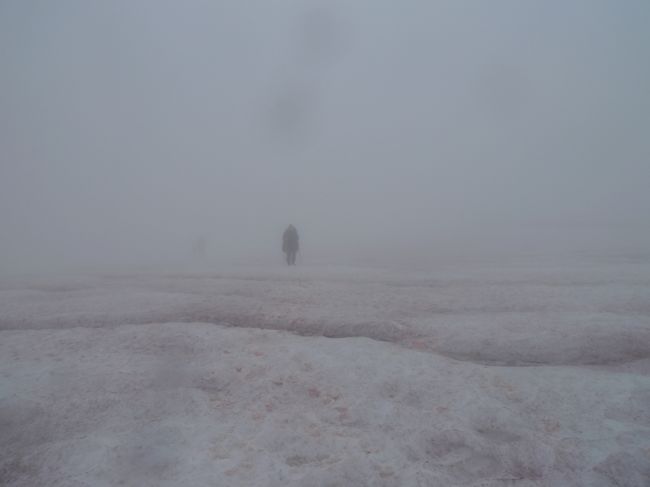 The weather was cloudy and we had some small showers on our way up. We where lucky, it would have been hard to climb in the sun. After about a hour climb we reach the top, 1211 meter. We had a great 380 view. We continued following the ridge, we had a fantastic walk up there. We took our time, Christers leg was quite ok as long he was walking but a lot of pain as soon as we sat down. We had some lunch, again some left overs with some bread. It was such a nice place to be at as you had nice views every where around you. After the top 1016 we started to look for a way down on the east side. Most places was very steep but in the end we did find a way down. The west side seemed a lot easier but that would mean a longer way back to the car. We came down to a lake. 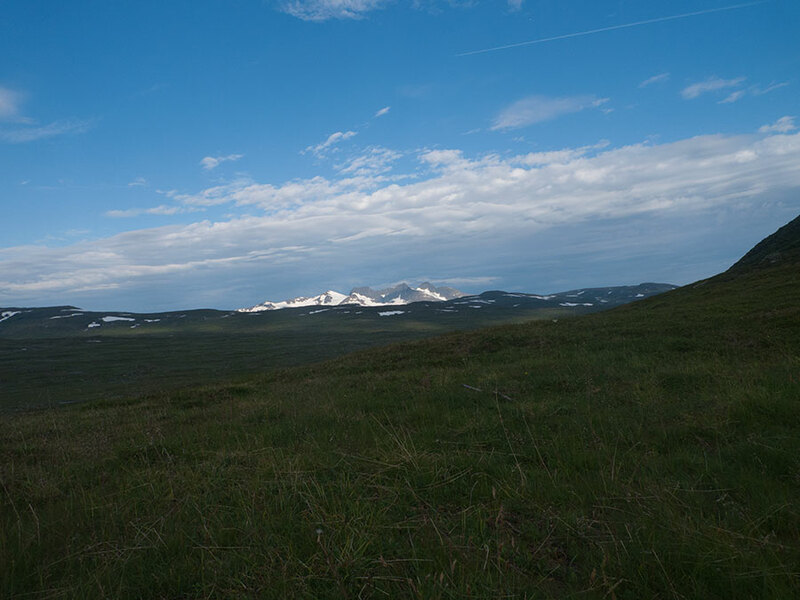 It started to get windy, we started to look for a calm place to set up our tent. By the stream at the north side of the lake we found it. 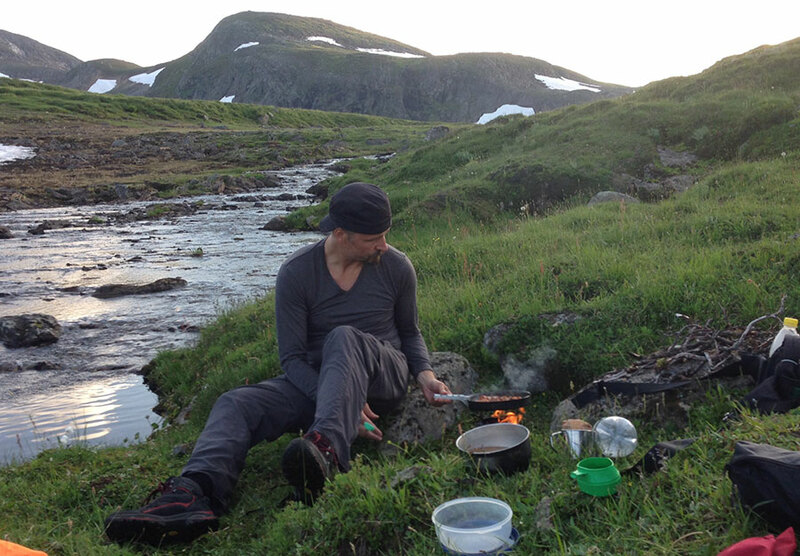 We made dinner, dried reindeer meat with mushroom, cream and with some rose-hip sherry. It was delicious. The wind was still hard and we went in to the tent for some shelter. Christers leg was still hurting and we decided to turn back to the car and end our hike. It was sad but still the few days we had had been really great. We followed the stream down the hill and found a way to cross it. We followed the three line, it was quite wet and hard bushes to walk through. We climbed around Vuelie Baatsoevaaratje. It was steep and it would probably been better to walk on the south side instead. 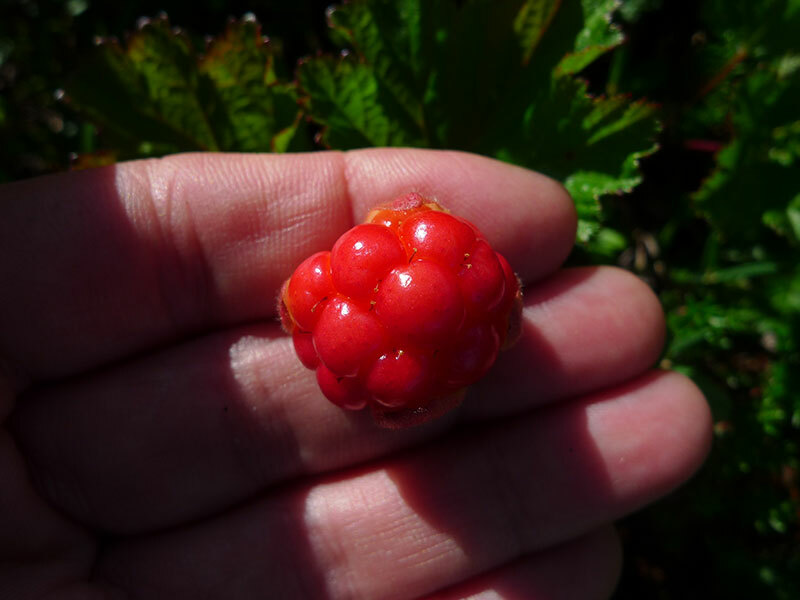 We found some cloudberry (hjortron in Swedish) but they where still red so we didn’t pick them. We came to the path that we followed our first day and followed it back to the car. It was hot so we took a refreshing swim in Över Uman. It was a nice end of a bit too short but a very magnificent hike.